Most projects I start are in 2D: very often pencil and paper, and just as often with Photoshop on my Wacom Cintiq. Nearly all my 3D jobs start with me roughing out my ideas in this way. 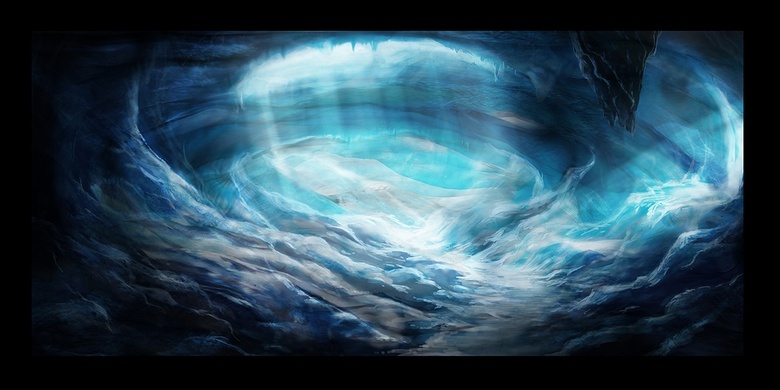 In this tutorial I will make an ice cave scene, starting by gathering a range of reference material that suits the tone of the work I want to create, then painting up a quick concept in Photoshop. That will become the guide to use when I take the project into ZBrush to make basic geometry for the 3D scene. 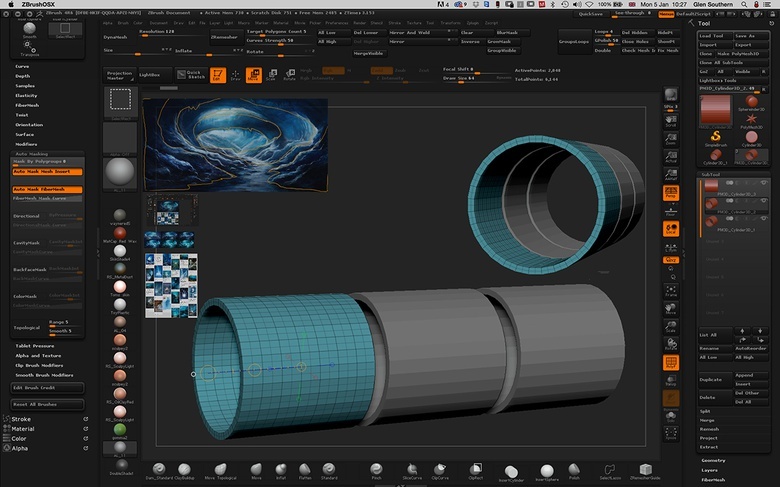 Starting from just basic 3D tubes, I will modify the geometry to make tubes that become caves. 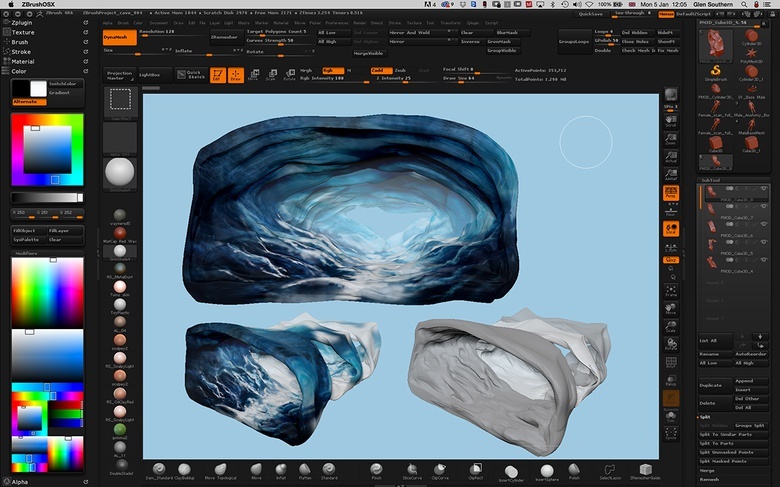 Once the layout is in place, I will use a range of tools and techniques to sculpt onto the caves' walls to match the reference concept. The final image will be made of the render outputs from several different lighting setups, composited in Photoshop. 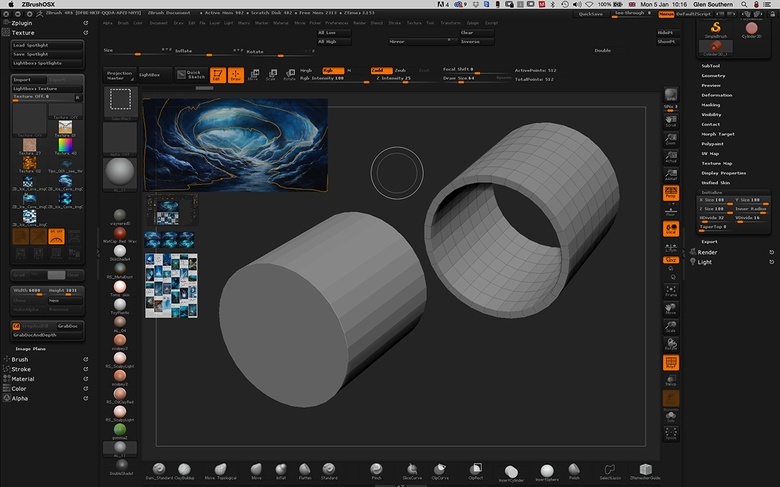 The tutorial gives a good idea of how I switch in and out of 3D for a project like this. 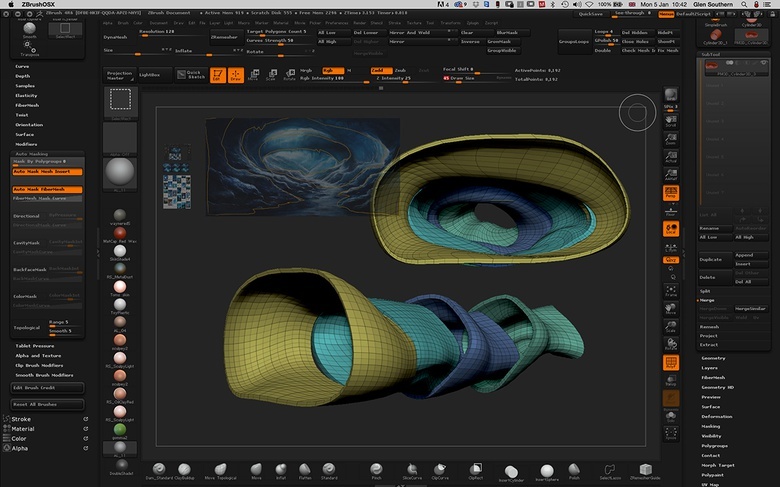 You will need a basic understanding of the ZBrush interface and know how to find the tools that I talk about, but I've tried to keep the number of brushes and tools to a minimum to keep the complexity of the tutorials low. Whenever possible I like to have a very clear idea of what I want to create when I start a project. For this image, I collect all of my reference material together and make a quick concept painting to help me work out things like composition before I even venture into 3D. Taking the time to look up images using sources like Google Image Search, Pinterest, magazines, or even your own photographs, will sort a lot of issues out for you before you even begin. You can then decide more easily on things like color palette, framing, perspective, atmosphere, and even how you want to light your scene. Once I have a really good feel for the image I want to create, I start to block out a rough painting, usually in Photoshop, but it could easily be on my iPad with Procreate or even sketched in my Moleskine sketchbook. At this stage I'm just trying to get a feel for the image I want to create, and to head off any issues that might arise later in the process. For example, I want strong lighting deep inside the cave, so I need to think about how to create the environment so that this would happen. Once I am happy with the general layout of the concept painting, I will work up some more detail. I can now start thinking about how to construct the scene in 3D. With this image, I decide to split the cave into tube segments to give the breaks I need down inside the cave where the ceiling has collapsed. 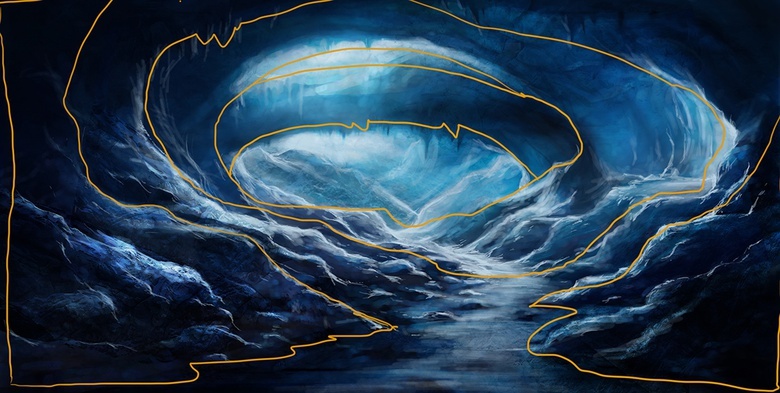 I paint in some areas of light and work out what angles the rays will enter the cave, and how the light will fall on the cave walls. This gives me a good idea of how shadows will fall, and even helps me work out some of the values. For example, the low light at the front of the cave yields some very dark tones in the hidden areas. Having a great reference painting and reference material is fine, but I need to be able to use it without having to switch out to Photoshop to see it every two minutes. You can use See Through (see Top Tip #1) but the best way is to harness the power of Spotlight. Using the Texture panel, I import the painting I've done and some of the reference photographs (either singly or as a composition). In the panel drop-down there is a button to Add to Spotlight. I do this for each image I want to use. 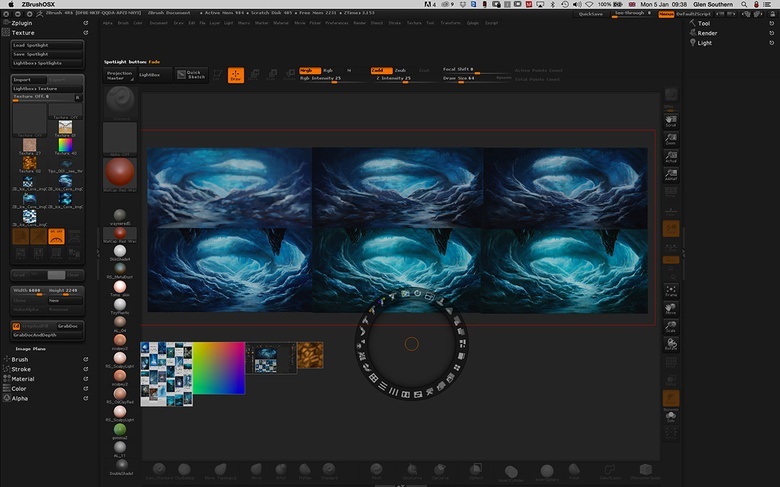 Add as many images to Spotlight as you need for the project - even textures for later down the line. As Spotlight adds the images, it shows them on screen and stacks them for me. The Spotlight ring in the center of the screen is how I control the images and make any changes. Using the ring I can scale, rotate, fade, change layout, and so on. For now I just need to have our main concept painting in the top-left of the screen as a reference. I use the ring to scale it down and place it up and out of the way. Later on I use Spotlight to add rock and ice textures to the models, but it is also the same process to add them to the Spotlight library. 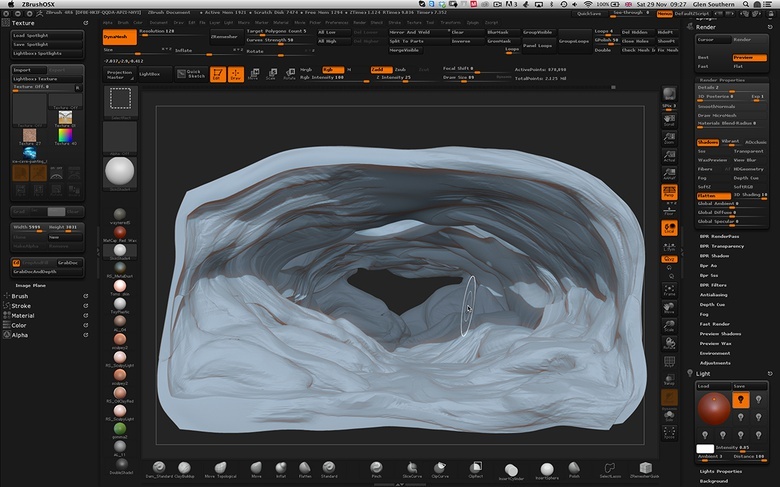 I start sculpting the cave by making a tubular section to work on, using a Cylinder3D from the tool panel. I go to the Initialize panel further down in the tool menu and change the settings to make a tube. An Inner Radius of 90 will suffice for now. 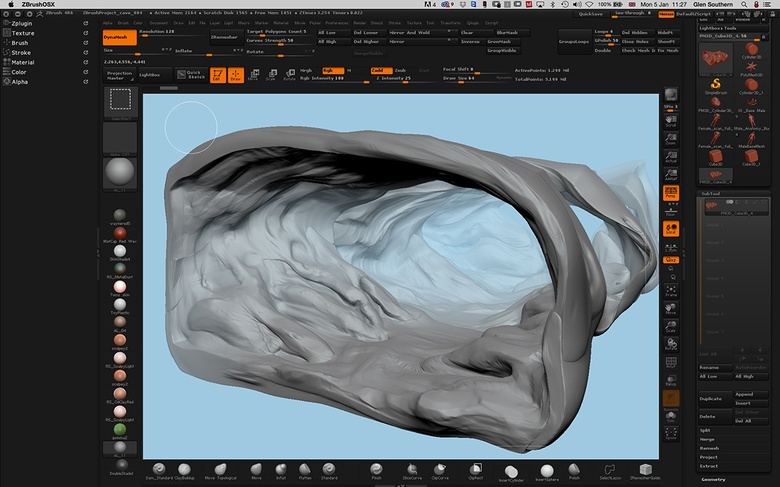 This gives me a tube shape to start making my first cave section. Check out one of the Top Tips to make sure you use Back Face Masking to protect outer areas of the tube as you sculpt the inner surface. Once I have the correct tube shape I make it an editable geometric model by hitting Make Polymesh3D at the top of the tool palette. I need a few sections of cave to make the scene, so I duplicate the tube and move the new sections backwards using the Transpose line. 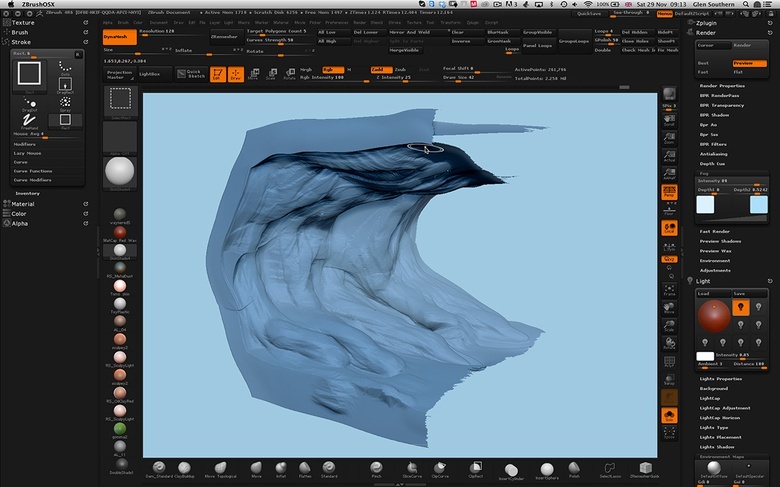 I can keep the sections all as one model or as separate ZTools for ease. As long as each one has its own Polygroup, either way is fine (Ctrl+W makes the current tool a Polygroup). I increase the polygon count of each one by subdividing it once (Ctrl+D). To keep the crisp edges of the tube, for now I turn off Smooth in the Geometry panel (smt). Next I'll start to shape the sections a little to match the reference. I only use the Move brush for the moment, and push and pull the tubes into the required shapes. I duplicate the last tube to make a fourth segment. I widen the mouth of the cave to match the camera angle, then add the rocky areas and floor to each of the cave sections (rough, blocky shapes for now). Looking from the side (outside), I make gaps to represent the holes in the cave roof where needed. I keep referring back to my reference sketch to make sure the shapes are roughly lined up. This is where Spotlight is great, as I can move the image over our model and make sure it lines up perfectly. I fade the Spotlight image a little. To give an approximation of the atmosphere effect, you can turn on Fog in the Render panel (under Render Properties). Down in the Fog settings, adjust the colors to suit. This gives a real feeling of depth while I am working, so I switch this on and off as I sculpt. I tweak the shapes a little more and then turn to the Clay Buildup brush to start detailing the walls and rock areas. I try to make sure the cave floor is level and even. I use the Clay Buildup brush with a very low Focal Shift setting. This gives me a very jagged rock-like brush that leaves rough hard strokes on the surfaces I sculpt on. I indent the mesh in places using the same brush but holding Alt. I use the Shift key to smooth areas, which works with most brushes. To get to the deeper areas, I hide parts of the mesh by holding Shift+Ctrl and dragging a green box over the areas I want to work on. The rest is hidden. Having the SubTool sections as separate SubTools can be an advantage here, but as the tools are all Polygrouped individually I can use Split and Merge back and forth as needed. At this stage I am looking to get the volumes of the rocks and cave detailing in the right place. I keep moving the Spotlight image over the model and checking the alignment of each segment. I try to focus on the mid-ground, as the foreground will be in partial darkness and the distance will be obscured somewhat with light and thicker blue atmosphere. At this stage the rock surface is very rounded and blobby, so next I will focus on using some different brushes and Alphas to add better surface detail. The final image will be rendered in ZBrush but composited in Photoshop using lots of different render passes (and lots of different materials) from the BPR renders. It is always useful to try out different renders early on to see how the shadows will fall. You can try different materials even at this early stage with no textures. It's a good time to go into the light panel and move the light a little to try different looks. You can go into LightCaps and add more lights to suit the scene you want to build. I now add some color to the segments using Polypaint. I merge the segments into one SubTool and divide two more times, giving me millions of polygons to Polypaint on. I use the Spotlight image (Z) and paint the concept painting onto the mesh as a starting point. I then place the reference back to the top-left and start working dark patches of rock into the scene. I start in the foreground and make that very dark-blue and brown in places. Moving to the mid-ground, I start adding lots of light colors and blues where the snow meets the rock. Try to keep the white/light colors to the tops of rocks and surfaces as if they are snow drifts or ice has formed there. To add details to the rock surfaces, I turn off Polypainting and do some detailing using a different material. Changing materials during sculpting helps a lot, as I like to see how different materials react to light and different LightCap setups. I load in some stone and rock Alpha brushes to the Alpha panel and use them to add detail to the rocky areas. It helps to use the Drag Rect Stroke type sometimes, as I can position the detail very accurately this way. Once I have enough detail in there I switch the color back on and add even more paint strokes matching the new rock detail. 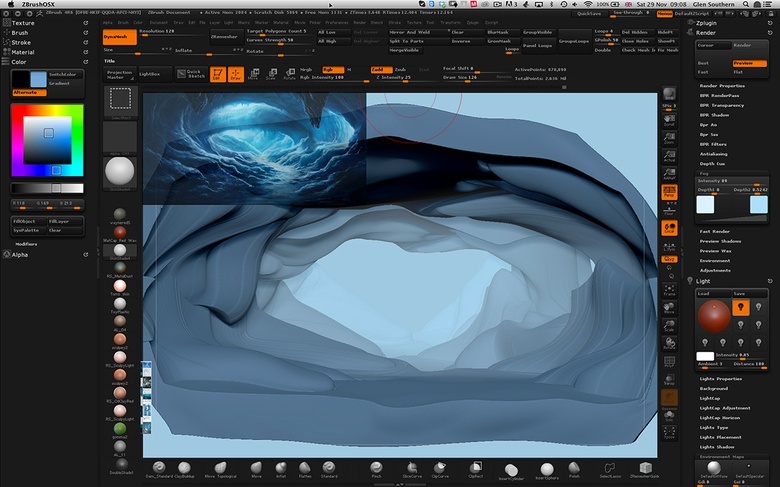 The final stage in ZBrush is to set up the scene ready for rendering. I do several renders with different materials to use in Photoshop. The Fog layer will only work with certain setups, so I save an unrendered version of the Fog layer. I capture an ambient occlusion pass, ZDepth pass, colors pass with a few different materials, a shadow pass, and anything else I think I may need for the final. 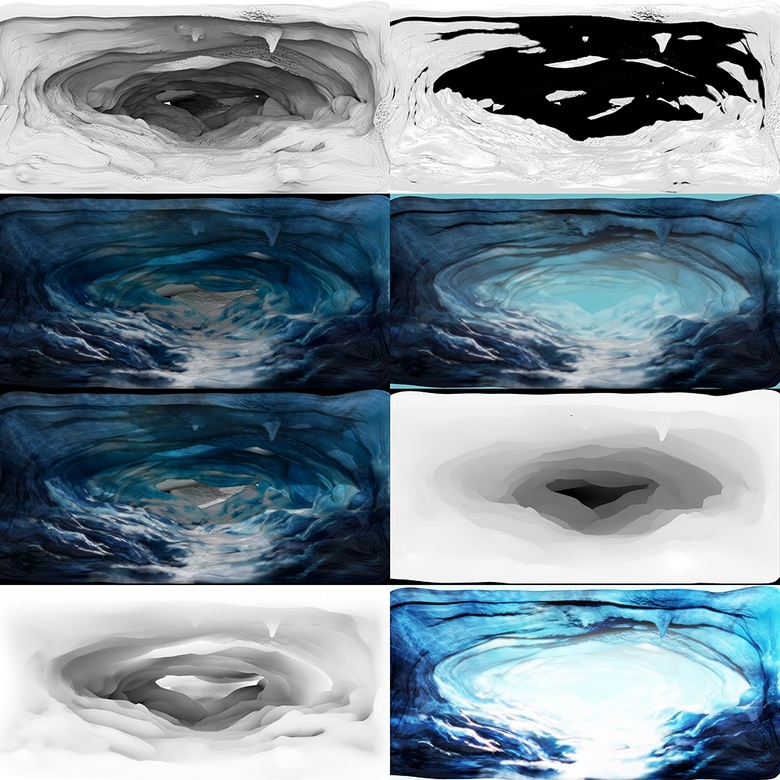 These are all available in the BPR Render menu each time you render a BPR image. I use several different light setups that give me information to use for the front, middle and rear of the scene. And after compositing, the image is complete! To learn more sculpting tricks and see me in action, check out the downloadable video included with the assets for this tutorial.